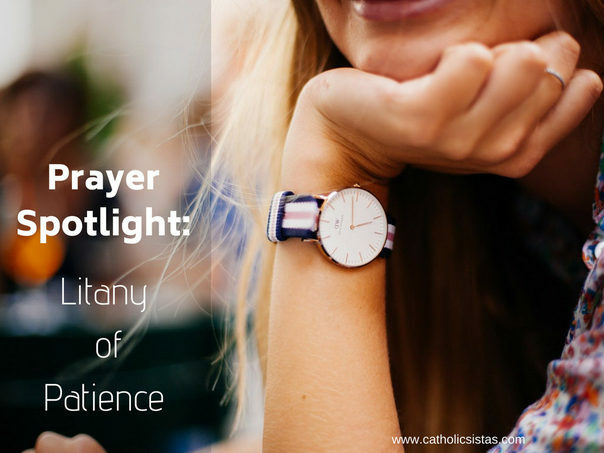 The Litany of Patience has been one of my favourite and most frequented prayers. It was written by a fellow Catholic blogger Christina Dehan Jaloway (check out The Evangelista). I used to pray this litany daily during a time of waiting. I find myself visiting it again now, in an effort to let go of my comfort zone. I am currently studying and travelling in South Korea this summer, which is keeping me on my toes for what the Lord has planned for me next. As exciting as it is to immerse myself in a new environment, I find myself overwhelmed in many ways. The noise of this new place has challenged me to find God in spaces I am unfamiliar with, but even more importantly, in stillness. Response: …Deliver me, O Jesus. From the desire to control my life. This desire emcompasses my “default mode”. I am always thinking about how the next month and year is going to pan out, to the extent that my grip on the “Ideal Vision Board for a 20-something year-old” tightens. What am I going to do with my life? Immediately I am zeroing in on opportunities and doors that are within my reach. Overcome with so much worry, my mind is closed to anything that God may have in store for me. It helps to look into the heart of Mary when God gave her the news that would forever change her life and the lives of everyone forever. She embodies the phrase, Thy will be done. No ifs, ands or buts. A true act of humility to say, “although my will is desirable, I choose Yours”. I enjoy speaking and using words to connect with people and show them who God is. Admittedly, using my mouth improperly is a giant I have yet to conquer. I often speak without thinking first. There are times when it’s too early to speak, but I choose to open my mouth anyways. Gossip is a sin that I have been struggling with. I think it’s a wound that many women carry. Sometimes it’s hard to identify when saying nothing at all is better than saying something. It is very easy to use our voice for selfish reasons. We shouldn’t be ashamed of it, but realize that our mouths are powerful tools in letting the Word come to life. Let nothing but love come from your lips. This desire to speak may even apply to our prayer habits. How many of us fill our prayer times with only voice? How often do we sit in silence and listen to what He has to say? Going to adoration regularly has been powerful in many ways. It trains me to sit still for an extended period of time, open to the Spirit and to His word, not mine. I bring in my troubles and intentions for the day, but like an effective relationship, you have to listen and wait for what the other person has to say. How can we ask God for so much and be unable to wait for His next move? Have you ever thought that maybe you exercise impatience the most consistently with yourself? We are not always going to be the best examples of perfect daughters, sisters, mothers, or women of God. Think of how many times you’ve sinned and punished yourself for being too weak or stupid. Our Father wants us to be patient and more loving to ourselves. How can we give the people around us patience if we are so unforgiving to ourselves when we fail? As much as you may lose patience with your husband, kids, or parents, remember that you are also imperfect and still worthy of their love. He calls us to love who He loves, and we forget that that includes us. This line so beautifully (and painfully) explains where many of our rash reactions to situations are sourced. Who knew that it was a show of impatience to act out of emotions such as these? Acting out of discouragement and fear is a sign that God’s promise has slipped away from our minds and hearts. It’s a sign that we decided to allow other things to replace that promise. Things that are not of Him. As a result, we react in hopes that we can reduce the feelings of uncertainty or minimize the pain we may feel. Without the patience or grace to endure, we end up more disappointed and discouraged. That I may maintain an eternal perspective in all that I do. This line echoes a podcast I heard by Matt Smith. From what I remember, he said to act not so much with the end in mind, but with eternity in mind. Having an “eternal perspective” seems so daunting and quite honestly, hard to keep up. When I read these words, I am at the same time asking for maturity in my faith. Like with many things, only through practice and experience can one learn. I feel that my challenge is to really exercise this eternal perspective. To always be reminded that when we seek Him, even if we can’t see clearly through our tears and frustrations, we will ultimately see a greater glory–beyond the troubles of this world. He will open our eyes. I hope that this powerful prayer is one that can inspire all of you, dear sisters, to exercise enduring patience, move with the Spirit, and surrender your plans to the greatest of them all. EGG-straordinary Lenten Rosary Project for your Family Groundhog Day “I hate waiting” Come, Holy Spirit, and Give Us Patience I give up!